To retain the purity of the Golden Guernsey breed & to lay down rules and regulations & eliminate incipient bad points. We run TGGS through a group of enthusiastic volunteers who bring a variety of backgrounds & experience to our development. "We hope you enjoy looking at our website and would like to think that it will encourage you to keep goats. Whichever breed you choose it is a commitment but you are amply rewarded in so many ways. 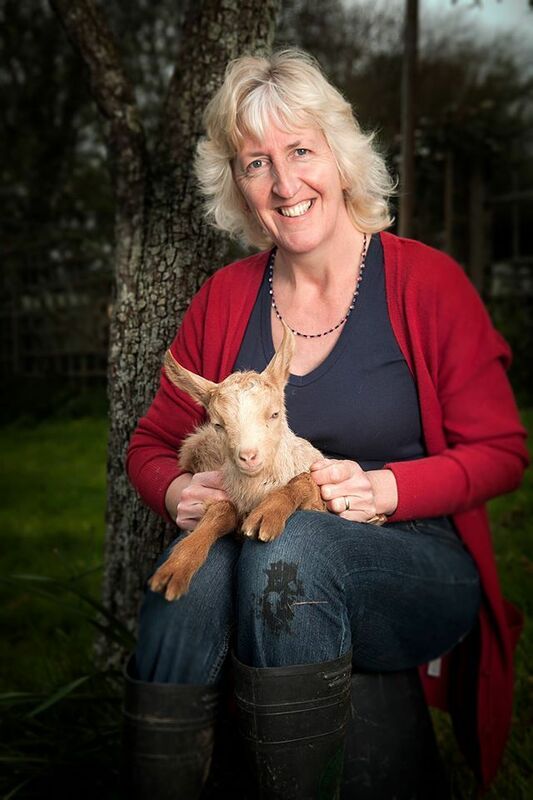 If you already keep goats, we hope these pages are helpful (we are all still learning) and that your enthusiasm is rekindled - after all, 'goat keepers never die', they just smell like their Billies!" I am a Cabinet maker/joiner but in my spare time keep our herd of Goats. My first goat as a boy was a neutered Billy called Seamus. 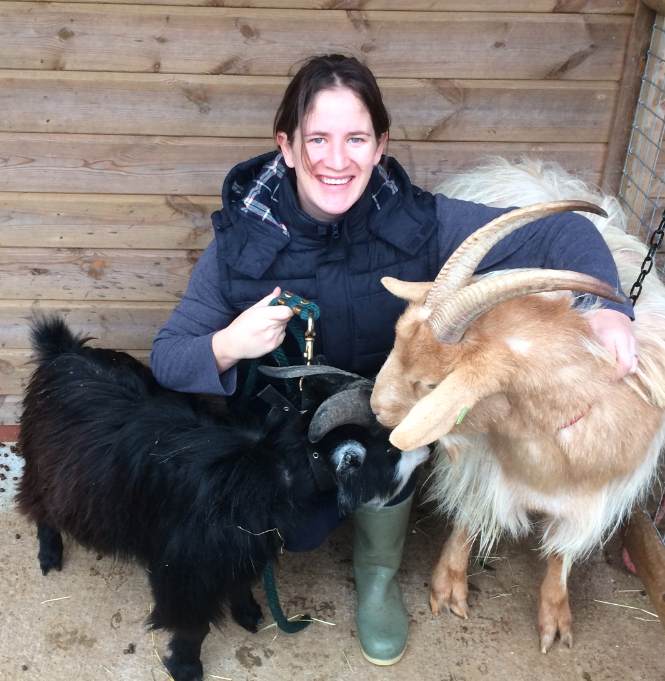 When Mandy & I moved back to the family home in St Peter’s, I decided to get some goats again, only a couple! (We now have a large herd!) I would love to see more Golden Guernsey goats being kept locally; they are a rare breed and a special part of Guernsey life that could soon be gone. I started keeping goats in 2009 with two female kids, Bijou and Adele, from the Douit Beuval herd. I planned to breed for when I retired in 2011 and expected to have more time! At the moment I have seven but am hoping that two of my girls will kid this year. 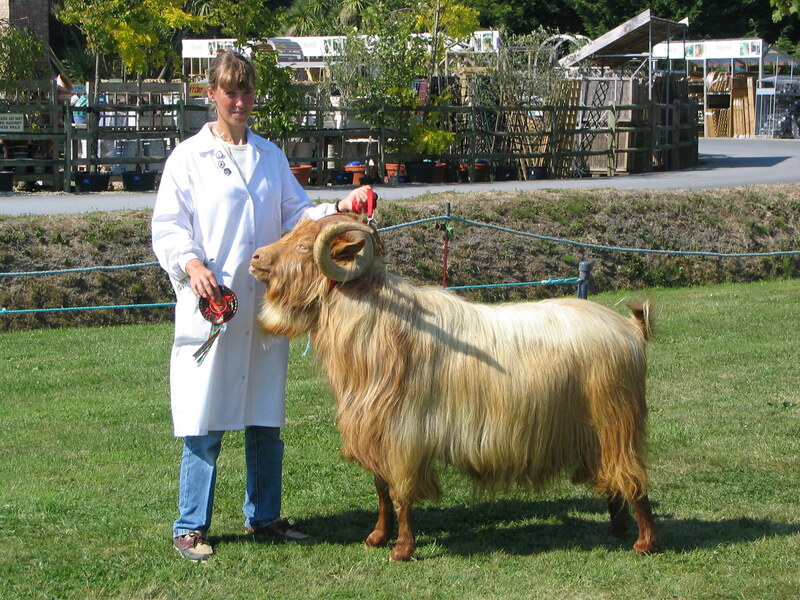 The goat in the photograph is Delphine du Catillon (my herd name) daughter of Bijou who sadly is no longer with us. My first real interest in goats was when people started knocking on our door asking for goat milk from Peter’s two little goat lawn mowers! Since then I have got the goat bug! I make and sell goat cheese, milk and meat. I especially love the spring time when all the kids are born and my favourite breed has to be the Golden Guernsey, they are so friendly. I am involved with TGGS through the ownership of my two Golden Guernsey girls. I am interested in raising awareness of the society within the Island and further afield through development of the website & getting involved with the events that TGGS host. We are very lucky to have the assistance of John as TGGS Honorary Vet. John is a partner in the thriving and well-equipped mixed animal practice, The Vetcare Centres, working on domestic pets, farm animals, equines and exotic animals. He has a wealth of experience in many areas of animal health & welfare that have taken him to all corners of the globe. 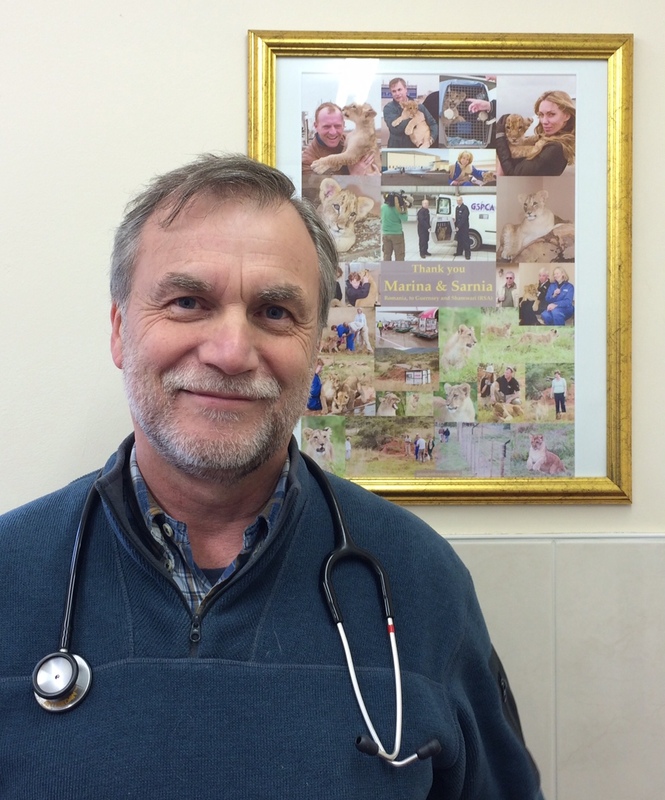 He offers his expertise to many charities in Guernsey & beyond, including the notable The Born Free Foundation of which he has been senior veterinary consultant for the past 16 years. The Guernsey Goat Society was inaugurated in 1922 with 30 members. One of the aims of the Society was, ' To encourage the keeping of goats and to improve the breed of goats on the Island' . A Herd Book was opened in 1922 and members were encouraged to register their stock. At the 1928 meeting the question of Stud Goats was discussed and a list of eight available for the season was drawn up . Miss Scaramanga from the mainland was asked to judge the show in 1928, she presented the Society with a trophy which was to be known as the Scaramanga Cup for long lactations. Mr and Mrs Clark presented the Society with a silver Challenge Cup . The Society had a healthy membership with stock being registered in the Society Herd book and keen attendance at the shows the main show being held in July each year, there was also a section for goats at the Royal Guernsey Agricultural Society Whitsun show which at one time was held at the Fairfield near Castel Church. July 27th 1939 saw the last show before the German Occupation, the Society held their last meeting on 25th May 1940 before closing down for the five years of the German Occupation although it was still possible to register stock during that time.. At the end of the Occupation the States of Guernsey reported that "The humble goat was a lifesaver supplying milk and cheese and was a valuable addition to the 4oz meat ration". The Society started up again in May 1946 and an advert was put in the Guernsey Press to publicize the first show since the Occupation, attendance was good and it was reported that, "An encouraging number of nice goats were shown". By 1956 there seemed to be a general lack of interest and the Society ceased to function. It was in 1963 that the Society started up again and from there interest and membership began to flourish with shows being well attended. In 1965 the Society opened a special section in the Herd book for Golden Guernsey’s, up until that time all goats, Golden Guernsey’s, Pedigree and non-Pedigree were all registered in one book. 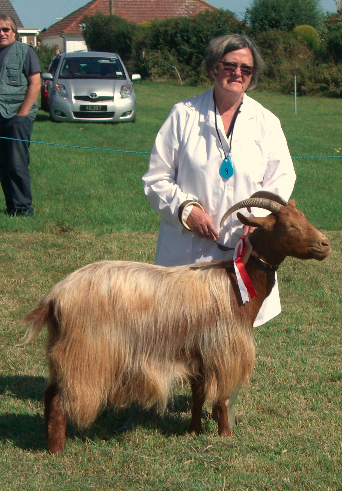 Each year in June a visiting show was held, the judging taking place at the home of the goat was done over two evenings, once your goat had been judged you could if you wished follow on with the judge to the next venue. At the end of the second evenings judging everyone ended up at the home of the last competitor where the results were given and trophies presented and for this occasion the Goat Society provided refreshments making a nice social evening. The Society membership grew steadily with much interest and a very healthy membership of keen junior members. The main show each September was always well attended with classes for AOV and classes for GGs. This show often not finishing until after 5pm. The 24hour milking competition an important class for those wishing to know the butter fat content in relation to the milk produced over a 24 hour period proved to be very popular .The children's classes also very well supported. An after show dinner was always very popular where the trophies for the day were presented. The Society purchased a pair of Hoof Shears and an Elastrator which members could hire at a nominal fee. Ear marking sessions were held on various afternoons during the spring and summer. In 1973 a Social Sub Committee was formed. Funds of the Society were kept up by very successful twice yearly Jumble Sales ( from these the Society gave a donation to a local charity) Also held were Dinner Dances, Raffles, Quiz Nights, Treasure Hunts, Barn Dances, Film Shows Spring Events and a Summer Barbecue were among some of the social events. During the summer months an afternoon of practical help for New and Junior members was held where advice was given on Hoof trimming, Grooming, Handling and Showing. Advice was also given on worming and general care. As in the beginning 1922 the Society's aims are still to encourage the keeping of goats of all breeds.